Moon of Saturn looks increasingly earth-like — The Cassini mission is sending us better data and images all the time of just what’s happening on the surface of Saturn’s moon Titan. And it’s beginning to look awfully familiar. 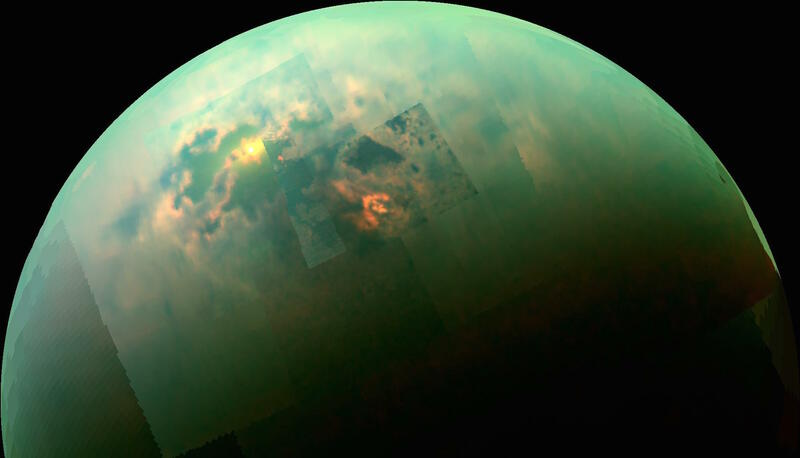 The latest data NASA researchers have been poring over shows new details about the strange lakes and seas that trickle across Saturn’s frigid moon, Titan. It also draws comparisons between the only other interstellar body found to have similarly liquid lakes and seas on its surface — our very own Earth. ~ I still don’t want to live there. We finally know what happened to Japan’s lost Black Hole Satellite — After a full month spinning out of control in space, Japan’s Space Agency has finally figured out how it lost control of Hitomi, a very expensive satellite that was hunting for black holes. This also means the agency will never get it back. ~ The equivalent of its wheels fell off – the solar panels. A mysterious object from Earth’s distant past has returned — A first-of-its-kind space rock filled with pristine material from the formation of the Earth itself has returned to the inner solar system, after billions of years in the cosmic boondocks. And it could help us piece together our planet’s origin story. Super-low-power RAM — Last week, Sunnyvale, California-based Adesto Technologies announced a new addition to its memory family, an ultra-low-power version of RRAM called Moneta. Adesto says its chips consume less than 1/20th the energy of the closest competitor. ~ Perfect for in-the-field devices you need to leave around monitoring flora and fauna. World’s smallest thermometer is made of DNA — Need to take a temperature in a hard-to-reach spot? Researchers have created the world’s smallest thermometer from DNA, and it could be used to measure temperature even within living cells. ~ I’m made of it too, you know. It’s remarkable stuff. 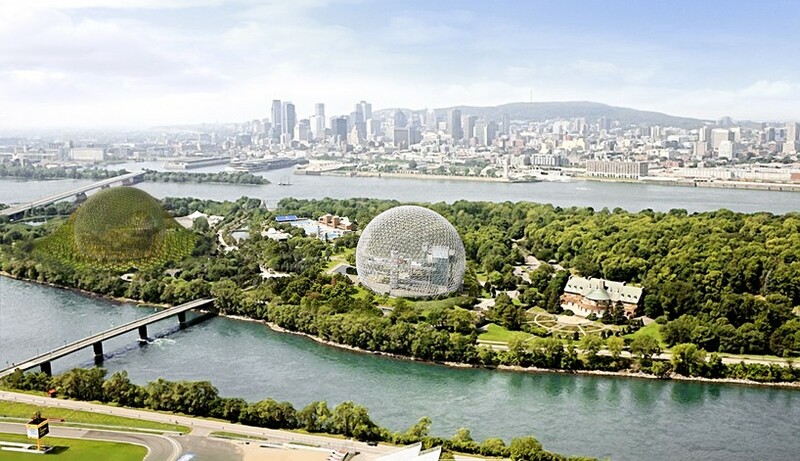 Buckminster Fuller’s Biosphere Dome Might get a twin made of plants — Montreal’s Expo 67 was the most successful World’s Fair in history, a vision of the future laced with monorails and space-age architecture. Its stunning centrepiece was the Biosphere, a 76m tall geodesic dome designed by Buckminster Fuller, which remained on the site after the fair left town. For the 50th anniversary of the Expo, one designer wants a vegetated version of the dome (left in the artists impression, above) next to the original (centre). ~ We used to call those ‘vegetated domes’ ‘hills’. New fake leather is made from tea — It’s tough. It’s thick. It’s brown. It’s a lot like leather — but in fact this new material is made in the lab from a brew of kombucha tea. Researchers from Iowa State University have developed the unusual new form of synthetic leather using some rather normal ingredients: shallow plastic tanks that contain cellulose fibres taken from kombucha tea, along with vinegar and sugar. When a colony of bacteria and yeast is added, the material grows on the top of the liquid’s surface. It can then be harvested and dried and — bingo! — a leather-like substance. ~ And when it gets wet, it’s game over. Double-Helix scientist may get biopic — Rosalind Franklin, the British scientist whose research enabled the discovery of DNA’s double helix, will be getting a biopic if spec script Exposure is made. Fingers crossed, because not only would a feature film bring Franklin some much-deserved recognition — her life would make for quite a dramatic movie. ~ Franklin has previously been the subject of a NOVA documentary on PBS, and a play called Photograph 51, performed in London with Nicole Kidman as lead.